In this lesson, we will learn how to convert decimals to mixed numbers and apply this to real-life situations. Convert 381.493 to a mixed number in its simplest form. Mona has 17 ounces of water. She used 4.2 ounces in one experiment and 4.5 ounces in another. Express the amount of water she has left as a mixed number in the simplest form. 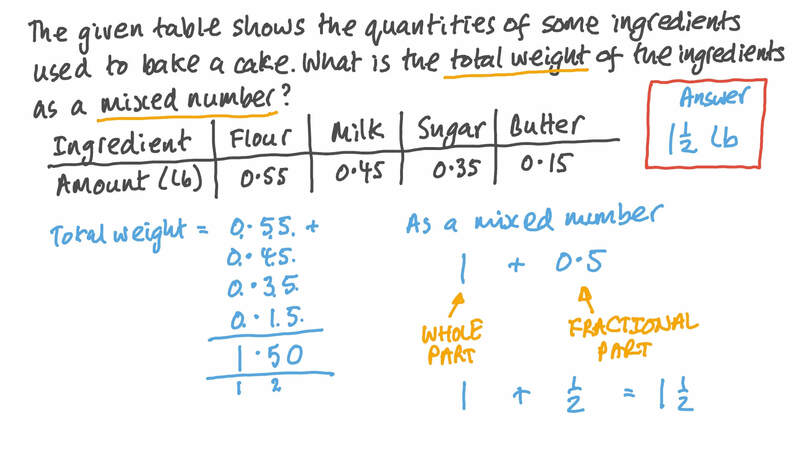 The given table shows the quantities of some ingredients used to bake a cake. What is the total weight of the ingredients as a mixed number? If Adel’s son is 6.75 years old, express his age as a mixed number in the simplest form. It takes approximately 4.65 quarts of milk to make a pound of cheese. Express this amount as a mixed number in its simplest form. The age of Earth is about 4 . 5 4 b i l l i o n years. Write this as a mixed number in its simplest form. The closest distance between Earth and Mars is 33.92 million miles. 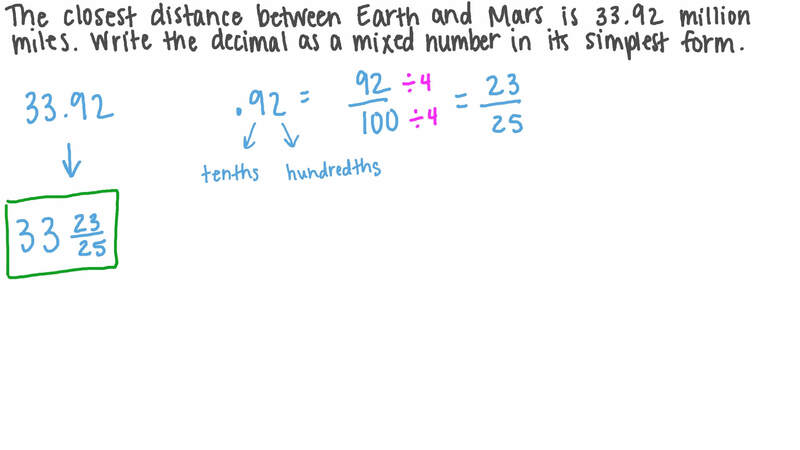 Write the decimal as a mixed number in its simplest form. Ramy rode his bicycle 4.7 miles to school, 6.2 miles to the park, and then 5.9 miles to his friend’s house. Express the total miles Ramy covered as a mixed number in the simplest form. Mr. Sherif’s car has an average mileage of 22.66 miles per gallon. Express this amount as a mixed number in its simplest form. Convert 8.58 to an improper fraction in its simplest form.